Wow! We are super excited with the outcome of this Deerfield, IL new patio, steps, and pavers installation. 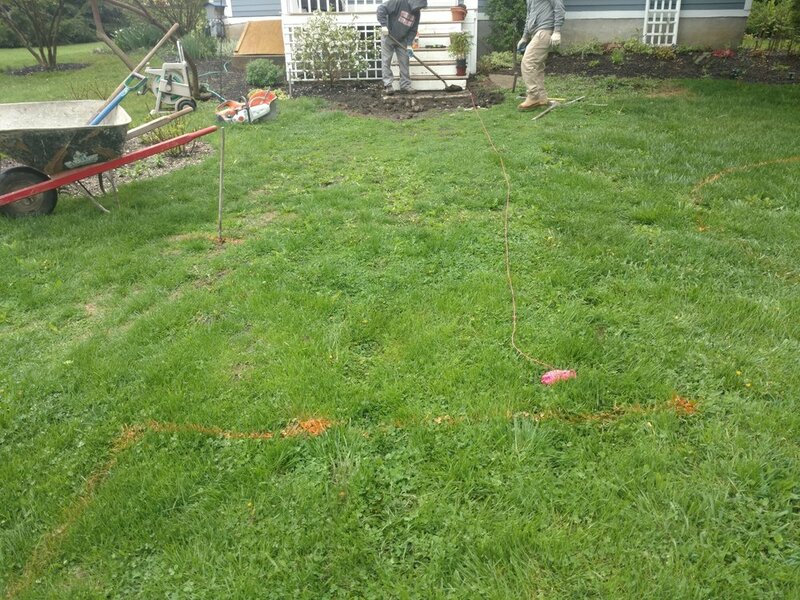 We were approached with this project potential to overhaul a new patio, and we put our best team on the project. This new Deerfield patio greatly increases the outdoor living and entertainment area for our customer. Take a look at the interlocking paver designs and natural colors that will stand the test of time and elements throughout the seasons of Chicago. Are you interested in a new patio design or outdoor living space overhaul (such as fire place, outdoor kitchen, etc.)? Please reach out to National Brick Paver and Stone to schedule your free cost estimate for a hardscape of your dreams. This spring in Highland Park, Illinois we installed a Unilock natural stone cliff grey covered porch and walkway. The hemispherical shape contours the landscaping and frames the front entrance for household visitors and owners to use. Perhaps you are planning to renovate your home's front entrance, or install a new paver entryway? We would love to assist in providing some design options such as these or others inclusive of pavers, bricks, lighting installation, and more! If you live in Highland Park, IL or surrounding Chicagoland area contact us to learn about how we can transform your home with new hardscaping. 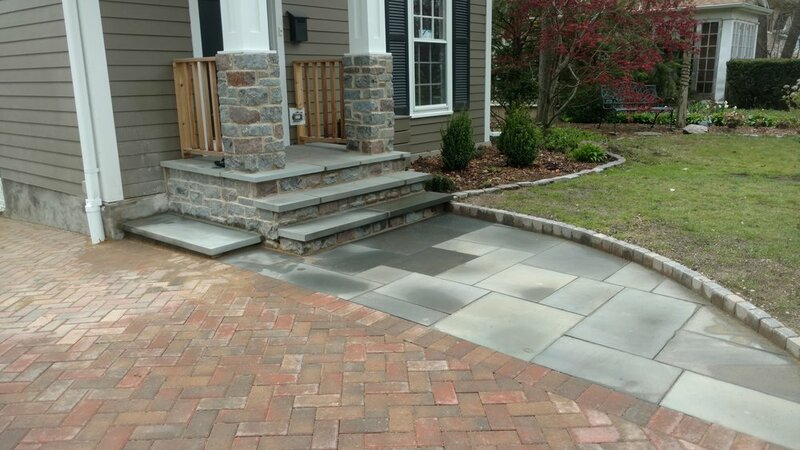 In this recent job, we tied two stone hardscapes together with some natural flagstone with gator dust between the joints. The gator dust was used to lock the larger pieces into place. By using a few different styles of brick, we give the space a feeling of transition and boundaries, while allowing for high quality and level walkways. Contact us before our timeslots fill up to schedule an assessment of your new brick and paver walkways in Chicagoland area. We had the pleasure of recently updating the side yard of this house in Glencoe, IL. We used a mixture of Unilock Holland Premier and Brussels Premier stone with crushed gravel corners. This is an excellent space for outdoor seating, barbecues, and more. As usual, we pay special attention to the design and layout of the space we have to work with as well as the geometry of hardscape installations. Learn more about us and our land/hardscaping work by submitting a request today on your new outdoor patio project. Here is a modern and fashionable walkway we recently built in Lake Forest, Illinois. To restore this area, we had to remove old boxwoods and replace with a full range of great new bluestone. Additionally, we planted perennials along with Kichler lighting products. If you are looking for a new hardscape, landscape, or outdoor lighting, please contact us to inquire about your home area. We will be happy to come take a look and create a custom landscape! For the next couple of days, we will update the website with our recent projects from last Fall throughout Spring. These will showcase before and after pictures of renovations across the greater ChicagoLand area. In Glencoe, Illinois, we recently installed a beautiful dry riverbed. Four downspouts converged on the side of this house along with 2 sump pumps. It was densely shaded and slopping. Adding a dry riverbed gave some beauty and function to erosion and sparse ground. We are always very excited when our satisfied customers write us exceptional reviews for their new brick and paver driveways, walkways, entryways and more. We are proud of our 5-star google rating and review online. This is not for lack of hard work and dedication on our end. We are very grateful for both the business and support of our valued customers. We hope that you see this as an example of the high level of service we provide to the area surrounding Chicago, IL. Here is another outdoor pool/deck area we recently completed in Lake Forest, IL. For materials, we went with Unilock Brussels in the full, half and XL sizes for a random pattern. Bull nose copping in Unilock smooth finish. For sand, we installed Techniseal NextGel Polymeric Sand and for polymeric sand application: rubber plated light weight compactor. Multiple passes with a dry surface so that sand settles to the bottom. National Brick Pavers is now servicing pool decks in the Chicagoland area. Below is a recent job we overhauled into this beautiful pool deck. National Brick Paver prides itself on making your pool area a gem of your house. This brickwork will last for generations of family and friends events in your backyard. We are pleased to showcase this recent job, among many other pool decks we are able to install in the summer months of Chicago. In a recent Glencoe, Illinois project, we removed 2100 square feet of driveway asphalt and installed Holland driveway pavers from Unilock in the rustic red color. The end result is a beautiful and timeless look that sets the house apart from others. It took some planning, but we also repaired a flagstone wall and added permeable landscape fabric with crushed rock for drainage. This will hold the test of time, and keep the landscaping looking neat for years with minimal upkeep. 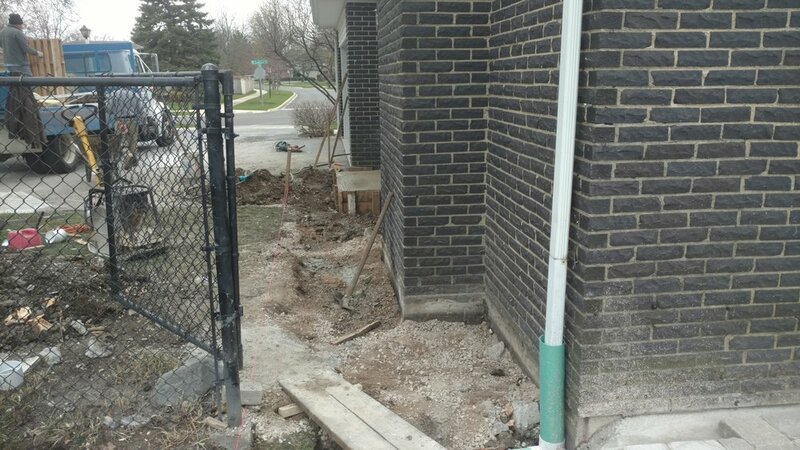 In order to follow code for the new front home entryway, each step must be at the same height. We always ensure our steps are usable and up to codes and standards. This ensures safety and professional aesthetics. A new step was poured and topped with thermal bluestone treads. Lastly, a planter was added to left so the homeowner can place new flowerpots. 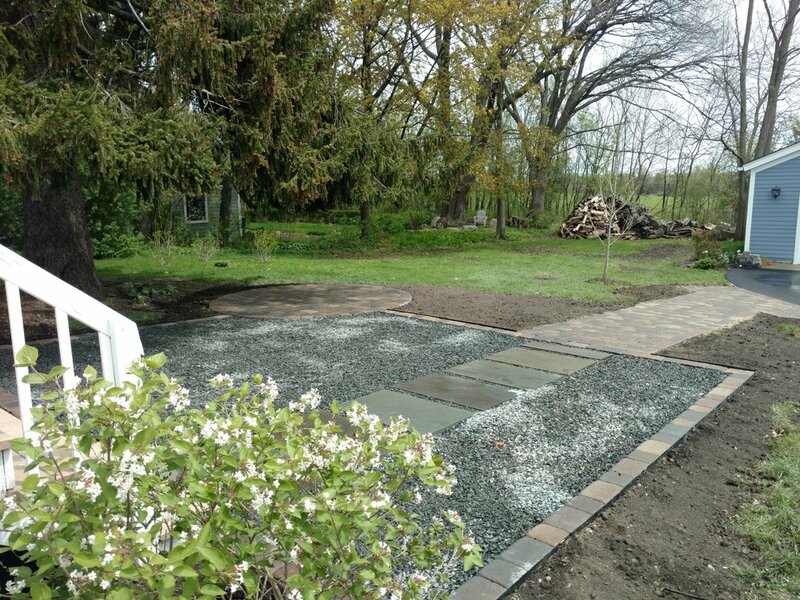 In our final process, we installed the Bluestone walkway to break up the maze of pavers from the driveway. Lastly, take notice of the stone that borders the grass keeps grade back. Thanks for checking it out! Feel free to contact us to do a similar job in your yard. Now that winter is coming to an end, we are starting to book up for the spring and summer seasons. Call today (847) 997-9463 to reserve your spot to ensure we make time to overhaul your hardscape. Need a new driveway, patio, or outdoor living area designed? Reach out to us at National Brick Paver & Stone to be ready for the next season.